EQUITY – TOP-9 in Ukraine! 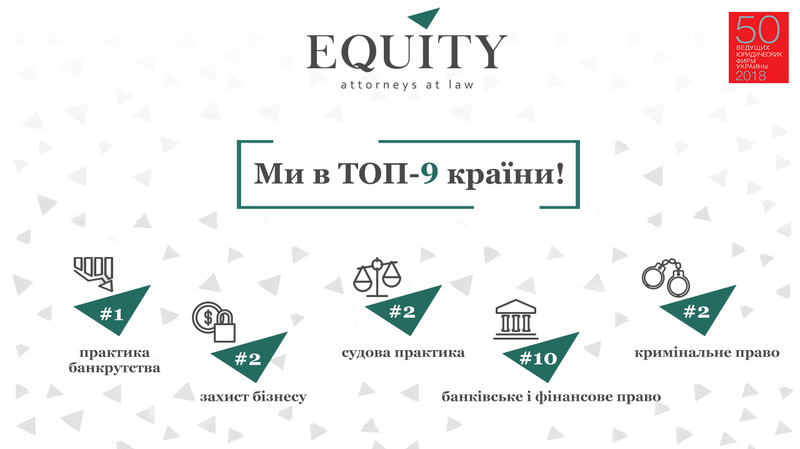 EQUITY has improved its professional position and was included into the 9 leading law teams in Ukraine! The achievement was confirmed by the annual rating “50 Leading Law Firms of Ukraine” according to Юридическая практика! Traditionally, especially valuable to our team is “Rating by Practices”, which is made based on recommendations of colleagues. Thus, EQUITY has reconfirmed its LEADERSHIP in Insolvency - #1, litigation - #2, Business Protection - #2, and improved its position in Criminal Law - #2 in the country. It also entered TOP-10 in Banking and Financing! In addition, two of our litigation projects are in the list of the biggest public court cases in the country: insolvency of companies of “Azovmash” group and disputes over illegality of actions of temporary administration and liquidation of PJSC “Ukrinbank”! We are proud of the work of our team, choice of clients and peer evaluation.